It’s that time of year again: the time of year where my quantity of photos taken begins to exceed the quantity of photos I can work onto the blog. I take my camera with me virtually everywhere: every time I go out on a walk with Raven down the road, or a hike with Dan out in the park, or out to visit friends or family. I even take my camera when I go grocery shopping in town, just in case I should happen to encounter something along the way (this was prompted by encountering a young snapping turtle in the middle of the road last summer, so I stopped the car to get out to help it across, and I was kicking myself for not bringing my camera). If there’s anything that catches my eye or even slightly piques my interest, I take a picture. Many of these, the odds and ends that I can’t work into a full-length post very easily, languish in my computer’s annals. During the winter the problem isn’t pronounced, but as soon as spring starts to break, my backlog of photos really begins to build, and I just can’t keep up with all the subjects I take photos of. Last year I tried addressing this through Today at Kingsford. I felt it was mildly successful, but ultimately still left lots unshared. This year I decided a better way to approach it would be to emulate the day-labeled themes such as “Skywatch Friday” or “Wordless Wednesday”, and start a regular series called Monday Miscellany. Although in my head Saturday is the most logical day for a week-end round-up, “Saturday Miscellany” just didn’t have the same sort of appealing alliteration. So Monday it is. This week’s header image is of a Green-margined Tiger Beetle, Cicindela limbalis. At least, I think that’s who it is; tiger beetles tend to be somewhat similar in their markings and general colours, and I’m certainly no expert, unlike fellow blogger Ted of Beetles in the Bush. It doesn’t help that my primary reference for all things six-legged, the Kaufman guide to Insects, only covers a subset of the more common tigers. So I turned to a book that I haven’t used a whole lot recently, largely due to its tome-like size: Stephen Marshall’s Insects: Their Natural History and Diversity. This is a great book, with a much greater breadth of diversity than can be offered in the smaller Kaufman guide (Marshall’s book is hardly a “field” guide, but makes a great coffee-table reference). I rarely fail to find what I’m looking for in there. 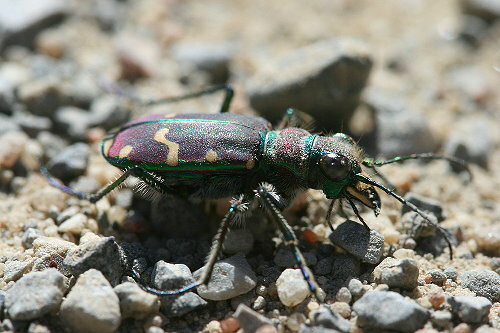 In this case, Marshall notes, “The Green-margined Tiger Beetle lives on clay soils across Canada and the northeastern states.” BugGuide.net, my number one online reference for all things six-legged, adds that the habitat is “usually steep, moist bare clay soil, including… dirt roads”. They’re out in the spring and then again in the fall. I spotted it moving along our dirt road one warm afternoon last week as I was returning with Raven. She was very good as I asked her to sit-stay while I photographed the critter. The beetle was also very good, though I doubt it paid any attention to my command to sit-stay. Prior to this I had only ever seen Six-spotted Tiger Beetles (C. sexguttata), so I was rather excited to discover this one. Insects figure heavy in this post. I’ve been seeing quite a few about recently, particularly late last week on perhaps the most gorgeous afternoons we’ve had so far this spring. This one is a bee fly, probably Greater Bee Fly, Bombylius major. This is a widespread species that flies in early spring (BugGuide.net says they’re most common in April), usually found near wooded areas, in sunny clearings either sunning themselves or visiting spring wildflowers. Last spring I noted one visiting the forget-me-nots in my parents’ garden. I saw four in various spots that day last week; this one was at the side of the road. Photo number three is an unidentified weevil. I think weevils are cool, with their long snouty appearances. 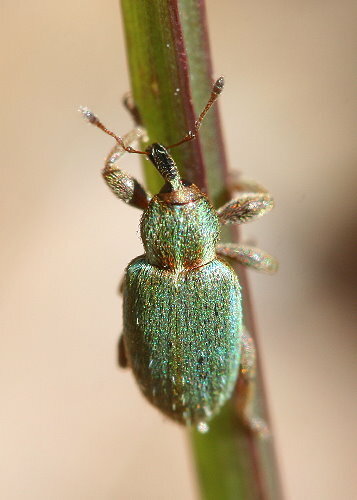 Although weevils are actually a type of beetle, they are generally thought of as separate organisms. Rarely any larger than a quarter of an inch, weevils are small beetles and this guy was as well. I was sitting in the leaves at the edge of a forest clearing, hoping for a bee fly like the guy in #2 (but not actually that individual) to come land near me, and I noticed this guy crawling through the litter and then up a grass stem where he helpfully sat and wiggled his antennae for a few moments while I took a photo. On the evening that followed that beautiful day, I set up my moth sheet with great anticipation of what might arrive. I was not disappointed; I had a few hundred moths come in, of upwards of three dozen species. But they weren’t the only things to come to the sheet. 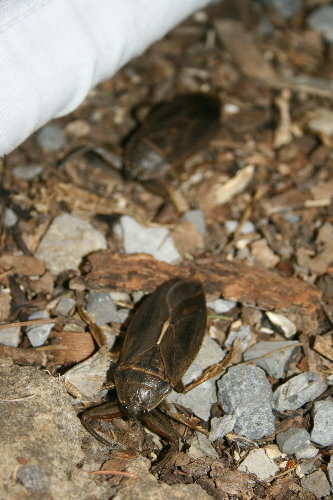 There were also small beetles, a couple of ichneumonid wasps, and these guys, Giant Water Bugs, Lethocerus americanus. I encountered them for the first time last spring, at my parents’ place. They are the creepiest bugs, huge, some three inches long, with giant forearms that look fearsome. They are in fact capable of giving a good nip, and I haven’t tried handling them. They’re capable of flying, although they’re a bit lumbering as befits something of their size, and as I was standing out by the sheet it was hard not to get a little anxious with these huge bugs buzzing by me. There must have been at least 20 that arrived, drawn in by the blacklight. The leaf litter was alive with them. At the abandoned property that I visit from time to time, some years ago the owner must have planted some spring bulbs, looking forward to a time when they would be moved in to the completed house and would have a full garden. The house was never completed, the owners never moved in, but the bulbs remain. There were crocuses, tulips, and a couple of patches of mini daffodils, all of which have grown over the years into small clumps. 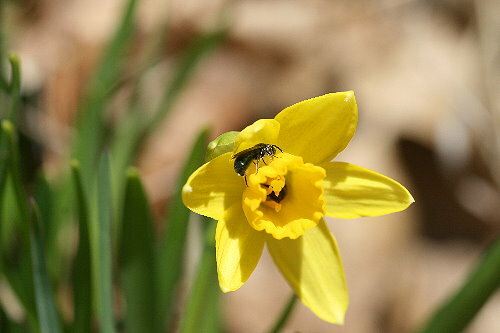 Two daffodils were blooming when I was there last, and were being visited by a few little insects, including this small bee (I think). 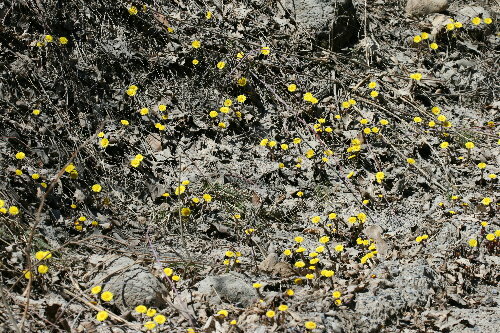 Speaking of yellow flowers, our roadside, or at least portions of it, are awash in yellow Coltsfoot, Tussilago farfara. These are one of the earliest spring flowers, and at least for the past few years, have been the first one I see in the spring. They’re such cheerful flowers, bright and sunny, it’s too bad they’re non-native. As Raven has gotten older, she’s taken a greater interest in sticks. She never eats them, but she likes to carefully and methodically shred them to bits. No bit of wood is too small for consideration. 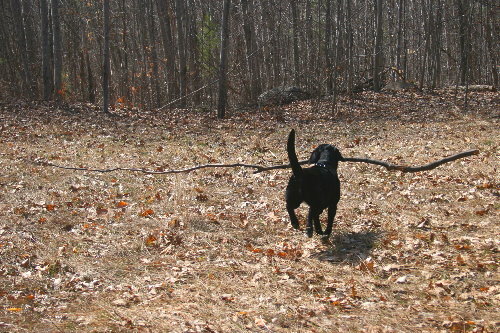 And few sticks, it seems, are too big. We LOVE Monday Miscellany! Each photo was so fun. We know exactly what you mean about taking the camera everywhere — it seems that the moment we decide to ‘leave it behind, just this once’, we run into a perfect situation to take a photo. Can you imagine the innumerable photos, sitting on the computers of nature bloggers, that will never be used? But perhaps that mimics the wonder of nature — once we open our eyes, there is so much bounty and amazement to be found. Thanks for the great stories and photos, Seabrooke! Glad you enjoy it, K&R! It’s nice to be able to post about a variety of things, rather than my usual style of a single topic per post. And it does help to bring a few photos to light that may never otherwise be seen. It’s funny how things seem to know to appear when you left your camera at home, it’s almost like another one of those things like Murphy’s Law. A nicely entomocentric post! Yes, your tiger beetle is Cicindela limbalis – down here in Missouri the white markings are much reduced. It’s a handsome species. 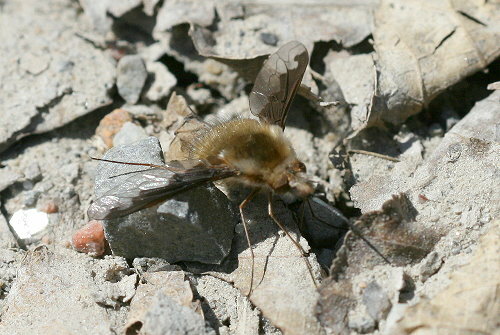 Larvae of the bee fly you have pictured are parasitic in solitary bees, but there are related species of bee fly that parasitize the larvae of tiger beetles. Thanks for confirming the ID, Ted! It certainly is a spiffy beetle, all the more so by being the first one I’ve seen. That’s neat about the bee fly larvae, my books/sources didn’t provide that information, and I didn’t do too much digging for this post. I think Monday Miscellany is a great idea! Even if I didn’t get to it until Wednesday! That last picture of Raven is so delightful. I miss the presence of a Lab in my life . . . what a great girl she is! Thanks, Liza Lee! Raven certainly has her moments, just like any dog, but for the most part she’s a real pleasure to have around. I’ve always liked Labs,too, both in appearance and personality. Thanks for the ID, Eric. Some of those little guys are beyond my identification skills. Hey, the plug is well-deserved! I’ve used other insect guides, but this one is by far my favourite. I’m with Eric on that (possibly) being a small carpenter bee. These photos are spectacular! I love insects, so you’ve hit a sweet spot here. I feel your pain on having more photos than you can post. I suffer that trauma all year long. Eventually I find myself running back two or three years and deleting stuff that never made it but that I kept around in hopes of posting some day. Some day… What a nebulous phrase. Thanks, Jason! I really enjoy checking out insects, they’re such an amazing and diverse set of organisms, and really underappreciated, I think. I’m impressed you actually go back and clear out your files. Once mine are on my computer, it seems they’re there for good, I never get around to deleting old or bad photos.